At The Lea we do everything we can to make sure our pupils are happy and thriving – and this extends to playtime too, which is why we have a ‘friendship bench’ in the playground. A friendship bench is a special place in the playground where a child can go when they want someone to talk to. When a child feels the need for a friend to talk to, he or she can show this by using the friendship bench. Other children and staff will recognise this as a sign that some help, support or comfort is needed and will come to talk with the child. 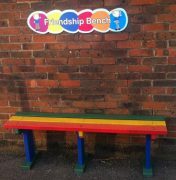 The friendship bench is a means by which a child can seek support without the need to rationalise their feelings or to seek out a particular member of staff or special friend. It can be used at any time and for any reason – from seemingly trivial matters to more serious concerns – and encourages children to ask for help when they are troubled.